Monarda is a sort of one-year and perennial plants belonging to the family of Lamiaceae. 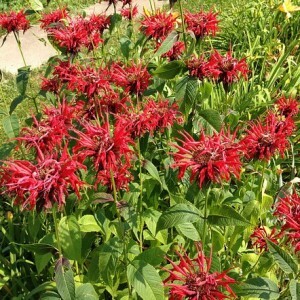 Monarda is a decorative plant from two- or three-storyed flowers, but also fine medicine with lemon aroma, and also an excellent melliferous herb. The homeland of the Bee balm is North America, there the plant lodges on meadows and forest glades. The name of a sort was given in honor of the doctor and the botanist Nicholas Monardes who wrote the book about plants of the New World. In the people it is possible to meet such names of this plant as monarda, the Indian feather, mountain balm, the American melissa, lemon mint, an Indian nettle, Osvego's tea. In the English-speaking environment, monarda is called often mistakenly a bergamot, probably, in view of similarity of the aromas exhaled by both plants. The leaflet of monarda impacts to tea the same pleasant relish, as a bergamot. Bee balm cultivation. All about plant.